Ever need a really quick Birthday card? I have a bunch of birthdays coming up this month and this one was so fast to put together... I actually made 3 of them! This file comes from Paper Piecings by Nikki - happy bumble bee. Paper I used came from my scrap pile, all cut on the Cameo. Stamp comes from Studio G.
The Ninjago party has finally happened and I have to say it was a lot of fun! Tomas had a blast with all his little buddies school, family and friends! We had rented out a Community Hall that used to be an old Movie Theatre. It was the perfect place for kids of all ages. The facility allowed us to play our own Movie, there was a play room (jungle gym), party room and many lounge areas for the adults. While the guests were still arriving and the place was being set up, the kids started off by burning some energy in the play room. Here are a few of my favourite pictures using the photo props and the background I made! I love the one of our little friend Sofia on the bottom left corner. She looks so devilish with that big smile and those frowning eyebrows... Looks like she's gone MAD, lol!!! There were Ninja eyes everywhere, watching every move we made! I am really glad I had set up the table at home prior to the party. It made the setting up at the Hall much easier, I knew where everything should go. It never even crossed my mind when I made this cake on how the kids would react to it when it was being served. This picture below says it all... The boys went wild, they thought cutting into Kai's head was the funniest thing ever! Maybe a bit morbid, but the expression on those little faces are PRICELESS! Thank you all so much for following along with all the party planning! Thank goodness these events only happen once a year. I'm sooooo "Ninjago'ed" out! If you missed it, here is a recap of all the links to the Ninjago Party + don't forget to pick up some freebie Silhouette files! Good Morning everyone! I have pre scheduled this post because I'm sure I'm going to need to recover from the night's festivities! Today I am sharing with you the cake I made for my son's 9th Ninjago themed Birthday Party! What do you think? I love how he turned out!!! Actually, wasn't very hard to make either. Here's a quick pictorial on how I made "KAI's" head. I baked, sliced and filled with icing, the centres of two 5 inch cakes. Separating the layers with a cake board. Next I dirty iced the entire head. Rolled out my fondant pieces. For the eyebrow, I drew and cut out a shape on a piece paper first and laid it on the fondant then cut it out with the tip of a sharp knife. I placed my pieces on top of the rolled fondant I used as the face. I "glued" the pieces with a little water using a small paint brush. Then I placed the face on the head. At this point I placed the head on the bottom layer of the cake that I had already covered with black fondant. Finally, I wrapped the rest of the head with Kai's Ninja mask. The top part of the cake is chocolate flavoured and the bottom 10 inch layer is made out of a yellow cake. The entire cake is covered with a vanilla butter cream icing and finished with fondant. Hope you have enjoyed this Ninjago Birthday Party Series of posts, I hopefully will have some pictures of the party to share with you all soon! 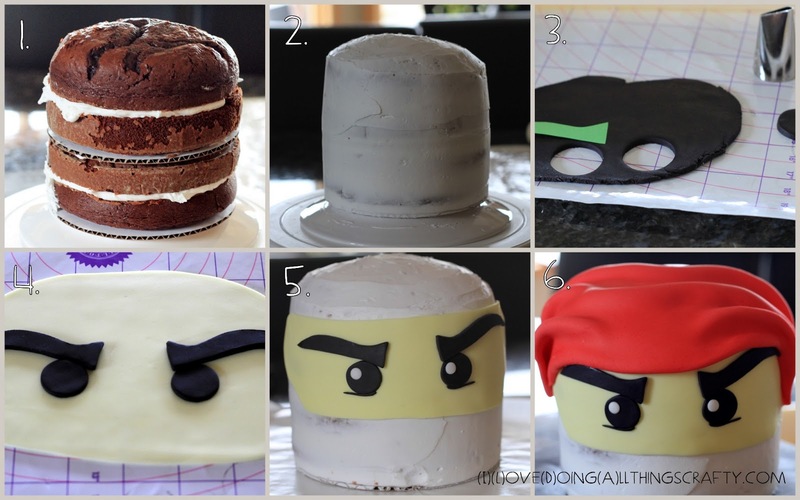 Labels: black and white, DIY, Kai, Ninjago Birthday Cake, Ninjago Birthday Party, Red, Tutorial. Well, the Birthday Party is tomorrow!!! I have been so busy with work and catching up with everything else around the house that I haven't had time to put up any of my recent Ninjago projects! Today I want to share with you the Ninja Stars I made for the kids. I remember making many of them as a kid, but have since forgotten. Click here for the pictorial I used to make mine. There are also a lot of You Tube videos on them as well! Hopefully we will have time to play a little game with them. If any of kids at the party want to learn how to make one themselves I will take some extra paper with me to teach them how. Today I want to share with you the Ninjago cupcake toppers I made. I'm still not sure I will be using them as that. I may just use them as food picks and sporadically place them on the food trays. I created them again using the Silhouette software. I printed them and the cut them out on the Cameo. Here is what they look like once they were cut out. They come together in a matter of minutes. All that is left to do is fold and glue them down onto a toothpick. I just used a dab of hot glue and pinched the two pieces of paper together onto the toothpick. Really easy! Now that you have seen the photo props, it's time to show you how I made the background for the Ninja photo booth, that will also double as a signature board keepsake. I wanted to used a simple pagoda image for my booth. This is the picture I used below as a guide. I just loaded the image on my iPad and just kind of copied it as best as I could... I wasn't going for perfection! I first joined two pieces of poster board and taped them to each other, leaving a seam down the middle. I used the seam as a guide and just pencilled the drawing in first. I then just painted the picture in with a paint brush and some red acrylic paint. You could also probably use a marker if you didn't feel comfortable painting. Here's a closer look... not bad for not being a traced image! I added thank you to each side, so that when our guests receive the picture it will also be a thank you to them as well! I am also hoping to get each guest to sign their names on it. This way Tomas can keep it as a keep sake from the party! It folds in half very easily and can be rolled up for storage. and his sister Maia telling Tomas he's "Dead Meat!" Oh, can you feel the love! I got my inspiration from here, please make sure to stop by and see all of the amazing ideas from her sons's Ninjago Party. Hope your enjoying all the Ninjago fun as much as I am!